Church and a US Navy veteran having served three tours in Vietnam. Gene and his wife designed and built over 13,000 custom trailers. 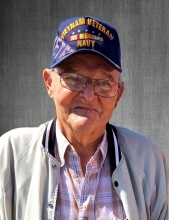 Surviving are his wife, Doris Kirkley Holland; one son, Russell Holland; three daughters, Cheryl Hayes (Rusty), Carol Peake (Marty), and Dale Hall (Eddie); eight grandchildren, and two great grandchildren; sisters, Jane McNeill (Allen) and Patricia Chapman (Frank). Memorial services will be held Friday, December 7, at 1:00 pm in Thorn Hill Baptist Church. Revs. Jeff Lageman and Steve Mackey will officiate. The family will receive friends in the church fellowship hall following the service. Burial will be private in the church cemetery. Memorials may be made to Thorn Hill Baptist Church, 2587 Kershaw Country Club Road, Heath Springs, SC 29058. Baker Funeral Home (bakerfunerals.com) is serving the Holland family. To plant a tree in memory of Louis Gene Holland, please visit our Tribute Store. "Email Address" would like to share the life celebration of Louis Gene Holland. Click on the "link" to go to share a favorite memory or leave a condolence message for the family.